Sparkster: Rocket Knight Adventures 2 (スパークスター ロケットナイトアドベンチャーズ2 Supākusutā Roketto Naito Adobenchāzu 2?) is the sequel to the Sega Mega Drive/Genesis game Rocket Knight Adventures. 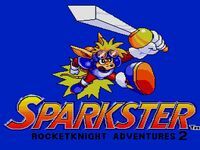 Another game under the same title, Sparkster, but without the Rocket Knight Adventures subtitle and not continuing the plot of the first game, was released on the SNES. A follow up to this game's plot, Rocket Knight, was produced by Climax Studios for downloadable services in May 2010. After the Kingdom of Zephyrus was rescued by Sparkster from the Devotindos Empire, the kingdom comes under attack once again, this time from the Gedol Empire led by King Gedol. Making matters worse, he has also dispatched Sparkster's rival, Axel Gear, to kidnap Princess Cherry, Princess Sherry's cousin. Sparkster once again rockets into action to save Cherry and the Zephyrus Kingdom from King Gedol and his army of lizards. Source: Wikipedia, "Sparkster: Rocket Knight Adventures 2", available under the CC-BY-SA License.